Roast vegetables are the perfect winter comfort food. Perfect for using up those vegetables left in the salad crisper the day before you do your weekly shop, roasting both softens and sweetens those unloved carrots, wrinkled peppers and neglected onions. Cut them up small for speedy cooking and sue what you have – this dish contains butternut squash, red, green & yellow peppers, cherry tomatoes, red onion, carrots and garlic. Any leftover roast vegetables can be quickly whizzed into a speedy soup, turned into a pizza or pasta sauce, used in a salad or frozen to use at a later date. Simple, frugal and adaptable. For speed and convenience I used a pouch of microwave rice in this recipe, you can of course, cook your own – make a double batch and freeze the leftovers. Love Baked Eggs? Try my egg recipe with tomatoes! 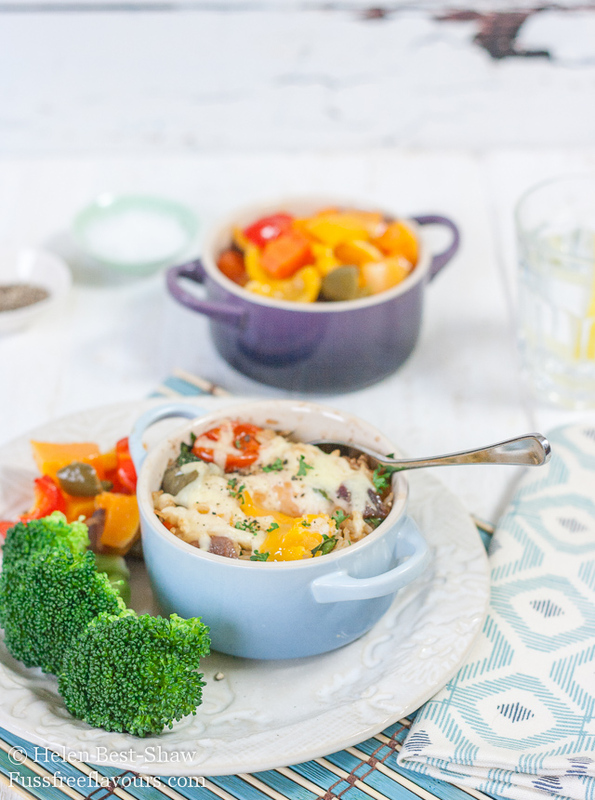 If you try this Baked Rice and Egg Pots with Roasted Vegetables please tag #FussFreeFlavours on Instagram or Twitter. It is amazing for me when for me when you make one of my recipes and I really do love to see them. You can also share it on my Facebook page. Please pin this recipe to Pinterest too! Thanks for reading Fuss Free Flavours! A simple family lunch or supper that uses up all those leftover vegetables in the salad crisper at the end of the week. Cook in individual pots, or cook and serve “family style” in a larger gratin dish. 500 g mixed vegetables – peeled and cut into approximately 1.5cm cubes – You can use squash or pumpkin mixed peppers, carrots, parsnips, onion. Preheat the oven to 200C / GM5. Place the prepared vegetables, oil, garlic and thyme into a roasting tray and give a good shake to mix. Season with salt and pepper and cook in the oven until they are soft and golden, about 35 minutes. Stir once during cooking. 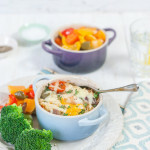 Mix the rice and cooked vegetables together, then divide the mixture between 4 mini casseroles, or pour into one large gratin dish. Make a well in the centre of each dish and pour in an egg. Top with a sprinkling of grated cheese. Bake at 180C / GM 4 for 15 – 20 minutes until the whites have set but the centre still has some wobble.